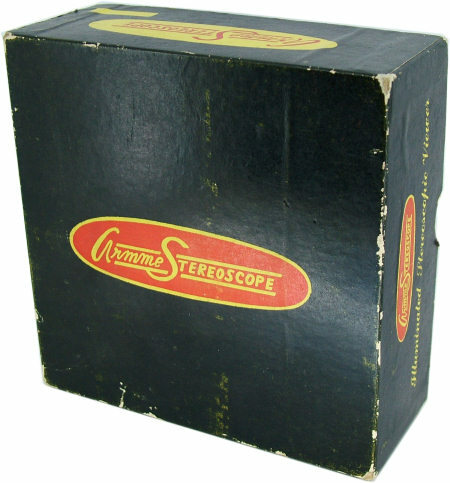 The Armme Stereoscope was manufactured in the United States by the Armme Company LTD. 608 South Dearborn Street, Chicago, Illinois in the late 50's or early 60's. It was made from rigid black plastic and was illuminated by a 3v single filament incandescent bulb, powered by two 'D' sized batteries. The lenses could be pulled out for cleaning and to allow a small degree of focusing to be achieved. The light was activated by a button on the underside of the unit. The viewer was comfortable and light to hold and worked very efficiently. The push-button that illuminated the viewer's bulb. This was located on the underside of the viewer and could be operated by either thumb.